Last night, David just kind of zoned out in the blocks box. Will very ready for a nap yesterday - or maybe just waking up. I forget! Thanks to the amazing generosity of friends and people we've never met, and considering the clothes we know are on the way, we no longer need anything for the quints except 5T clothing for the girls, 5T and 6T clothing for the boys, girl shoes in sizes 6-11, and boy shoes in sizes 7-13. Gavin and I are repeatedly and overwhelmingly humbled by all we've been given and all the ways we've been blessed by so very many of you, not least by your caring so much about our family and praying so fervently for our needs. Speaking of needs (or rather, lack thereof), Seth has been doing so well on his physical therapy and walking that the therapist is holding off on his little foot braces. She notes that he is self-correcting that funny left-foot-turned-outwards gait. In addition, his last food therapy session is Thursday! There's nothing left for her to work on, he's eating and drinking so much! He's gained 6 ounces, so that's a big praise. Please keep praying he keeps gaining; he still needs it. He should gain about 8 ounces/month. I need to get to bed and iPhoto isn't showing the most recent photos for me to put on the blog, so forgive me for the lack of pictures here! I just can't get over how much the kids are changing; how much they seem like little kids rather than babies now. 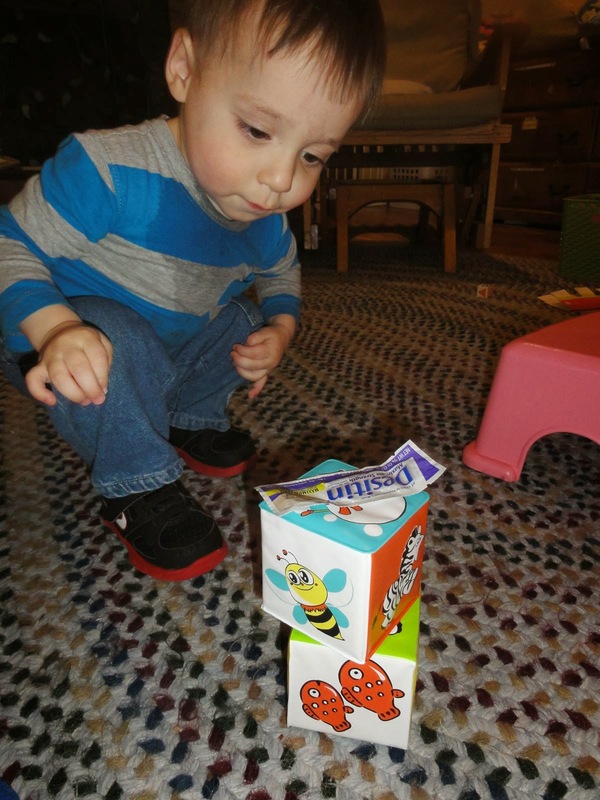 I pulled out the Matchbox cars for the boys to play with (under supervision) and got these cute pics of Will. David pushed the new MegaBlocks car (thanks, Piper and Sasha!) up and down the hall today just like Isaac always did when he was little, with both hands on the roof and beautiful leg coordination. All the other kids put the blocks and the driver in and took them out again. They know how to PLAY now. Sometimes they don't know how to play the "right" way, though . 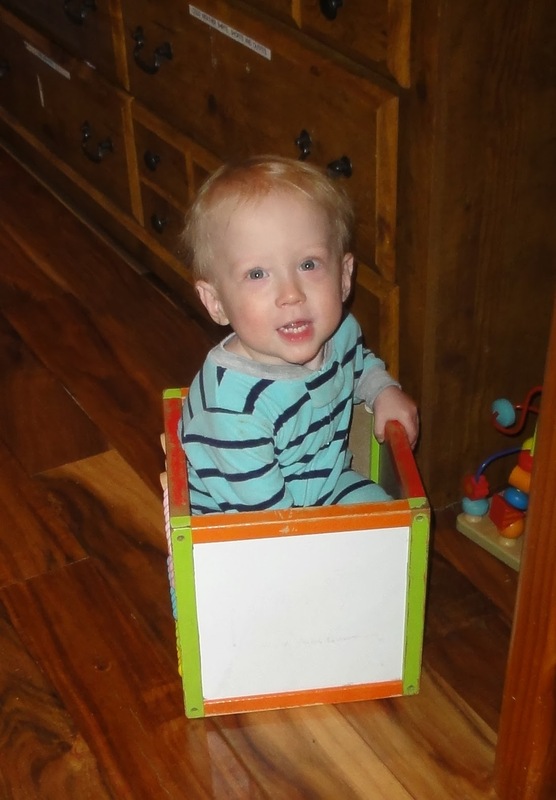 . . David loves to stick his legs in the seat of this little car (below), but then he can't break free again! I rescued him as soon as I took his picture - I wanted to remember this funny little quirk of his! Gracie and Marcie especially LOVE books still, but really all the kids enjoy reading. Their favorites are lift-the-flap, animal and noise-making books, so apparently they enjoy interaction. Marcie showing Papa a block. They kids still love to build their towers! Unfortunately, the kids don't just play with toys. Marcie thinks her hair + food is a great combination! She always rubs whatever she's eating into her hair, so when it dries it makes some pretty interesting hairstyles. It's definitely as effective as any mousse. This is one child who definitely needs and loves her baths! Gracie is so verbal these days! All the kids are learning new words, but Gracie seems to learn quickest. David tends to use more sign-language (and very effectively), although he can say as well as sign "more," for instance. Gracie started saying "baby" and "'side" for "outside" this week. She says baby when I hold her in my arms and cuddle her, or when I am taking her to bed. She says "side?" when she wants to go outside and she's running around gathering the jackets for me to put on the kids. Marcie darted past her and out the door without a jacket on, so Gracie tried to take her a little pink jacket to wear and was quite concerned when Marcie just ignored her, so then Gracie handed it to me as if to say, "You try to get this on her, please!" She was saying, "Side? Side?" the whole time. The funniest, though, was when she saw a 4T sized shirt and decided she needed to wear that over her jacket before she would be fully ready to go outside. She brought it to me with her little, "Side? Side?" question, and was very happy when I put it on her. Then, and only then, was she ready to begin her outside play. David and Will like to attack their siblings with ecstatic love. 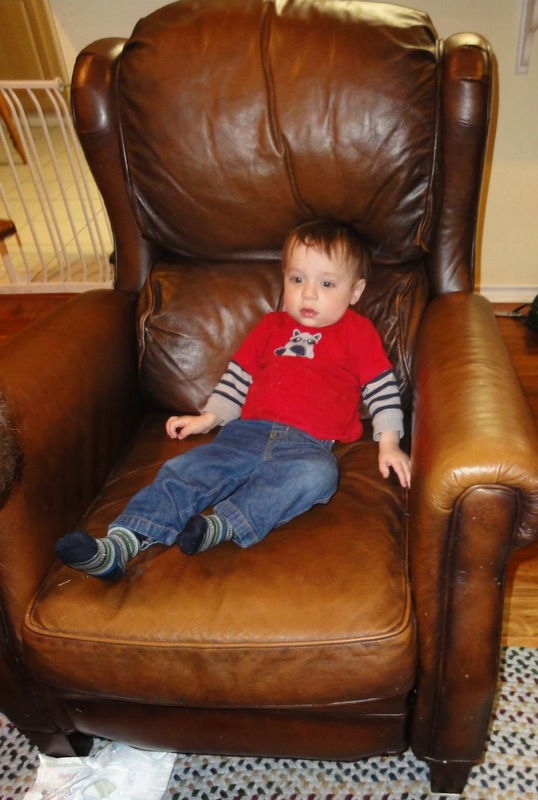 Depending on the sibling and the prevailing mood at the time (tired or not, for instance), there is either a laughing, squealing roll-around on the rug, or a screaming, fussing "Leave me alone!" response, at which point either Isaac or Gavin or I intervene. Isaac is so much more protective of the babies than we are, it's funny! He is so concerned they will hurt one another on accident. He actually asked me to pray for him to to "have wisdom in guiding the quints" on the way to school yesterday. What a precious big brother! He takes his responsibility very seriously. Right now Gracie is his "favorite," although he wouldn't say it. She and he just have a real meeting of the minds, and she laughs and squeals with delight at anything he does with her. They tickle and wrestle - so cute! All the babies beam at him when he comes around. Guess that's it for now from here. I'm sure I'm forgetting some sort of cuteness; there's just so much of it! P.S. Please pray for my poor, cooped-up Dad! That's one of the hardest parts of this surgery. We try to get over there to visit, but it's not the same as him getting to run the babies to Costco or ALDI or sit in the chair here at our house to hold and feed all the little "birdies." From Monday night . . .
A real candid shot. Left to right: Marcie (yes, with the book upside down), David, Will, Gracie and Seth. This happens most every night and sometimes throughout the day, although these beautiful days are largely spent outside. 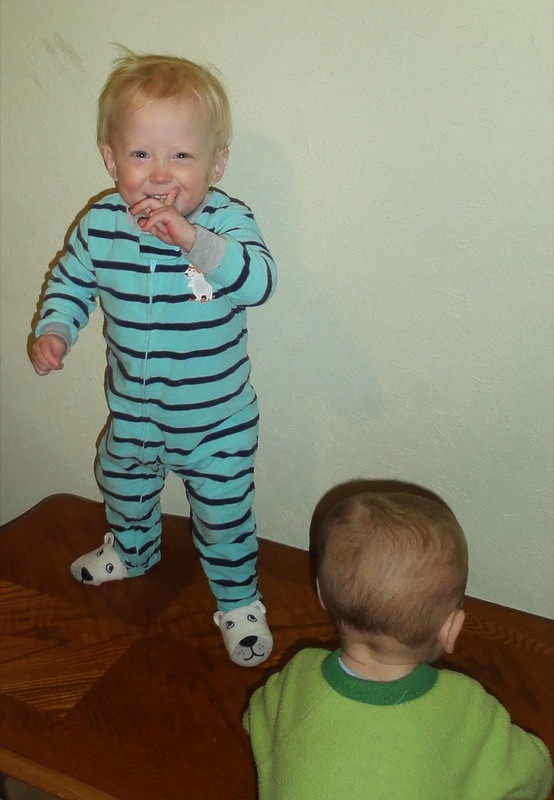 Boy clothes update - plus a charming picture! >> pretty much every type of clothing item sizes 3T-5T (shorts, pants, long- and short-sleeve shirts and warm pajamas). We only have a few items in each size thus far. >> shoe sizes 7-12, such as washable/cleanable Velcro sneakers, sandals, or Croc-type shoes, plus slippers for the nights and mornings. THANKS to Naomi for taking inventory of all the boxes that were in the attic! It seemed a huge, tedious and overwhelming job to me, although I am enormously grateful for the fact that we have boxes worth of lovely, quality clothes and shoes to take stock of. God bless all of you who've contributed to those boxes! The girl clothing still needs to be inventoried. I'll post that ASAP. 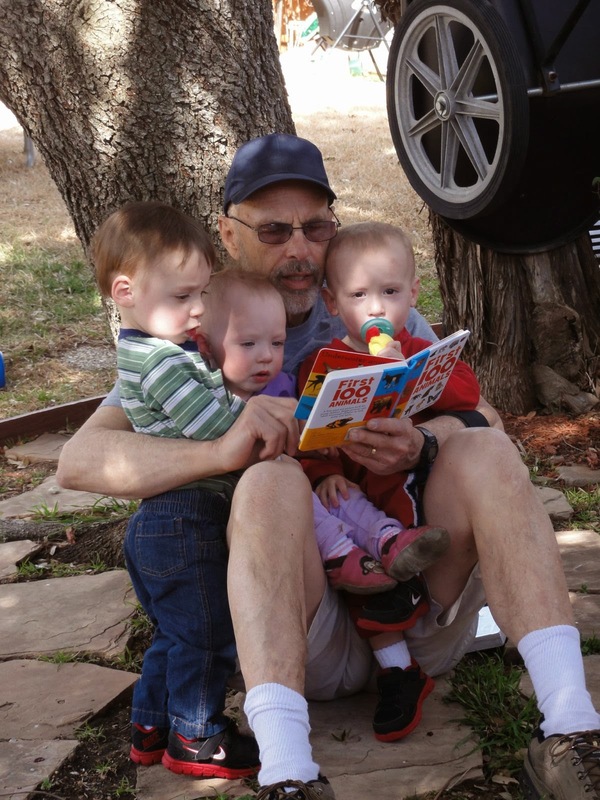 A beautiful day with beautiful children (Will, Marcie and David) reading one of their new books from Aunt Tracy with their loving Papa (Gavin's dad goes by Papa instead of Grandpa). In our backyard. My dad continues to do really well. He has some pain and swelling, of course, but the physical therapist today said he's about 10 days ahead of where most patients are at this point in their recovery, thanks to having been in such strong, good shape when he went into surgery. Thank you for praying! David got under the barbecue grill, the hose spigot, and the window box air conditioner today, apparently trying to figure out how each one worked. It's fascinating to watch their little minds develop. Seth has started saying a charming, "Hi-i-i-i-i!!!" with drawn out long-i sound. It makes us feel good. Today Marcie said, "Hi Daddy," but she said it to me with a charming grin. I guess she can say Daddy but hasn't mastered Mommy yet. Grace ran and got a jacket for her and a jacket for Marcie when we said it was time to go outside today, and Will ran and got Seth's shoes for him. It's funny that Seth has been the one the kids have gotten shoes for two days in a row now. He was perfectly happy to try to go outside without them on! I saw these photos tonight and thought they were cute, even though most are a week or two old. I may have already posted them; oh well! Dad is doing awesome! I am so proud of him as he walks so well and does so much on his own already. I took the quints over to my parents' neighborhood for an evening walk. Will and David were not happy to sit in the stroller; they wanted to invite themselves to the lovely houses we were passing. It was a bit crazy but lots of fun, especially to get to hang out with Grandpadad again as one big group! I need to get to bed and try to beat this annoying cough. No longer laryngitis, just itching throat. David. 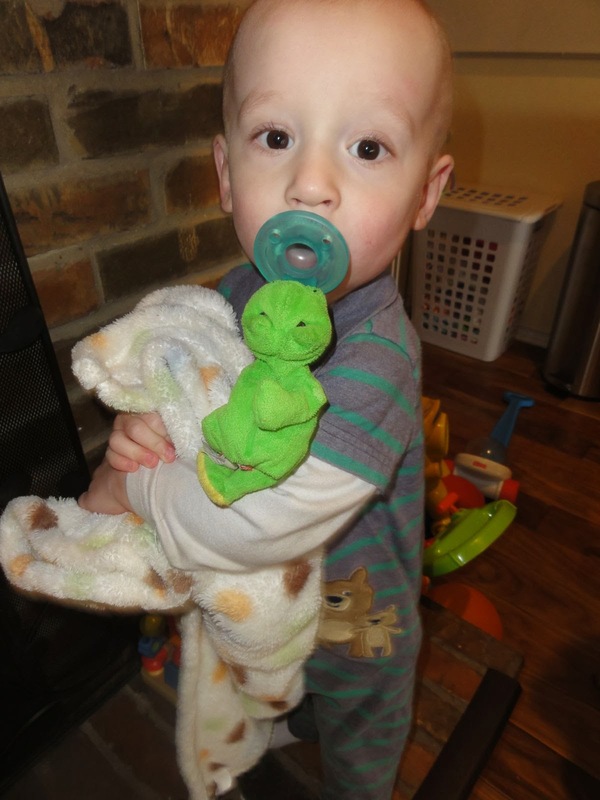 The kids love fuzzy blankets and pacifiers - with or without attached stuffed animals (These are called Wubanubs, and they include the little stuffed animal to help kids keep track of their pacifiers in bed.) We are happy for the kids to remain addicted to pacifiers until our trans-Pacific flight is accomplished - the difference in sound and contentedness is huge! It's funny, because I was pretty staunchly against pacifiers until we had preemies and quints. Turns out they are a "must" for development of sucking and eating ability in the NICU! David with Will in background. Two happy boys! This is from today, the only photo I have readily accessible of Seth for all you Seth fans. :) He's the one facing the camera, David and Will are to his right and left, respectively, and the girls have their backs to the camera. This is lunch time immediately after church, hence my nicer outfit and the naked babies - we didn't want their church clothes ruined, but also didn't want their play clothes dirtied right before their naps. David was the only baby up when Mom and Dad Jones arrived yesterday. He was very happy to see them! Marcie ran and grabbed jackets when Lynnette told her it was time to go outside yesterday. They understand so much now! Dad's new hip is functioning well! The doc said the old hip was BAD, really worn down. Dad has already walked up and down the hallway. Thank you for praying, and thank God for such a good outcome thus far. Please continue to pray there are no complications, Lord willing. Right now Dad is in only a little bit of pain; the worst is the nausea, which we pray passes completely. Thanks to those who prayed for Baby "Lea." Yesterday was a GOOD day for her in which the Lord's mercy and providence was clearly evident. 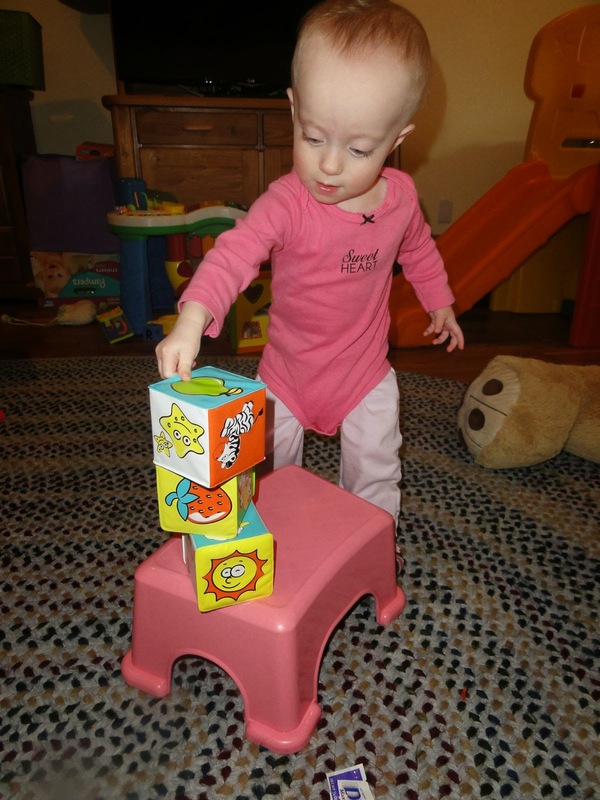 We pray such good days and outcomes continue for this precious baby girl. 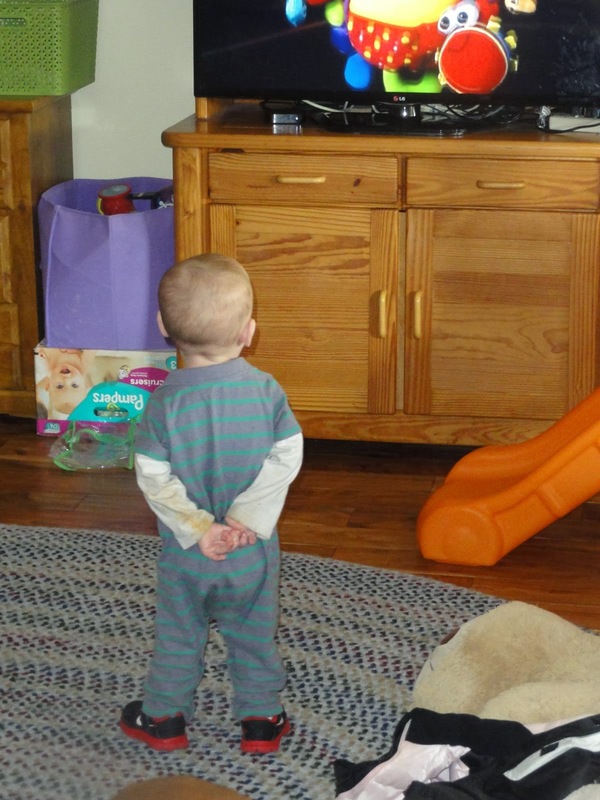 In cute quint news, Will watched Seth walking between Carlene, Lynee and Aunt Courtney in the living room last night, garnering LOTS of applause, so he decided he'd get in on the action. So Will, who has been walking for 3 months or more, walked between the ladies and received the praise and applause he considered was also due him. :) He was so proud of himself! Seth is practically running the last few steps between people; he kind of hurls himself into their arms. Dad took David on one last Costco trip pre-surgery. We'll have to take the babies to visit him for the next month. I started with a sore throat and achiness last night, and my throat is still swollen today with just an overall feeling of tiredness and being unwell. Gavin is also fighting a sore throat and exhaustion, and neither one of us can get the rest our bodies are telling us to get because we have five babies (no helper this morning). The thing is, my dad goes in for hip replacement surgery tomorrow morning at 5:30 a.m., and I had arranged help with the babies all day long so I could be the driver for my parents (it's up in North Dallas, quite a ways from here) and be with them during the surgery and initial recovery. PLEASE PRAY that I get over this today, if the Lord is willing! I would hate to miss being with my dear dad, "Grandpadad" to the babies. PLEASE PRAY especially for my dad's surgery to go as well as possible and for recovery to be as painless and successful as possible, and especially for protection from blood clots or any other adverse effect. My dad is in his mid-60's and has really bad hips thanks to playing football for Michigan State and always pushing himself to run, play racquetball, etc. 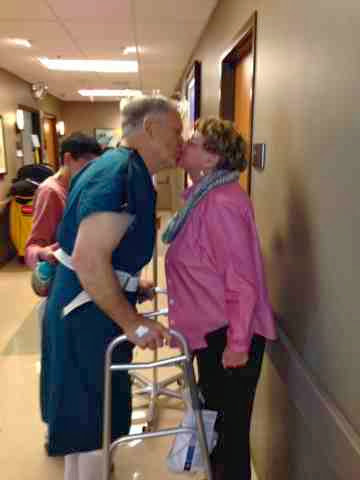 He no longer has any cartilage left in either hip, so both will need to be replaced. The doctor said Dad's hips are as bad as any he's ever seen - he was amazed at how much Dad still does! Dad is my go-to guy for extra help with the babies, runs to the store, and picking up Isaac. If you could please pray for stamina and rest for Gavin and me, for protection from anyone else getting this - especially our helpers!, and for super quick recovery, we'd really appreciate it. Also, I can't say more than this, but please pray for both immediate and lasting protection for "Baby Lea." Her life and future hang in the balance today. Jesus loves the little children! Thank you for caring and praying! 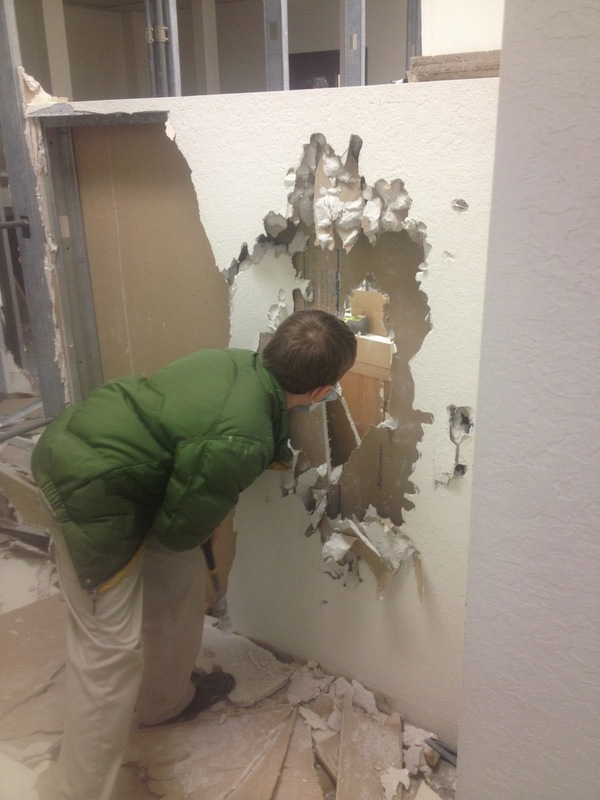 Isaac at work with Gavin after school - demolition is fun! Aunt Sam sent us these hilarious shirts: "I'm ALWAYS getting picked up by women!" Thank you, Samantha!!! We miss you and love you! A rough start, but he's well on his way!! Hooray, Seth! Walking at 15 months adjusted age (which is how they calculate when looking at milestones and development; 15 months old from his due date). If you build it, they will come! . . . and destroy it. Sometimes siblings make it very difficult to accomplish anything . . . But eventually it may work out, and it's usually a lot of fun! I love how the Desitin became the top of this tower (above and right). Thankfully Sarah was here today and yesterday to take pictures, otherwise I would have nothing to post. The couple of times I've tried to grab the camera the babies have stopped doing whatever cuteness they were doing or the camera batteries have died. A couple of extra photos of David . . .
My sweet little book-obsessed girls! Grace is the one holding the book, and she's headed to the bookstore with me now, thanks to Aunt Tracy wanting to buy us some more books - hooray! A dog book is a high priority. It is a LOT of work sorting and packing for four year's worth of clothing for quintuplets! I have been working since before 9 this morning, it's after 2 now, and I've barely scratched the surface. We are one blessed family!!! THANK YOU to everyone who has sent us anything. A number of people have asked me to please let them know what we need as we think ahead four years, living in a country where kids' clothing is hard to find (used clothing stores) or very cheaply made. That's why I'm trying to get this figured out now, and I will post it to the blog as per the request of a few of you - thank you! We've started an Amazon.com wish list with curtains, bedding, miscellaneous other things we'll need. There is absolutely zero pressure on this, though - you've given SO much already! It's largely to help me remember what I've seen that I like so I can be sure I get something like it before we leave. For instance, I registered for insulated blackout curtains because it gets cold at 5,000 feet at night and in the early morning, plus we'll be arriving during their winter! 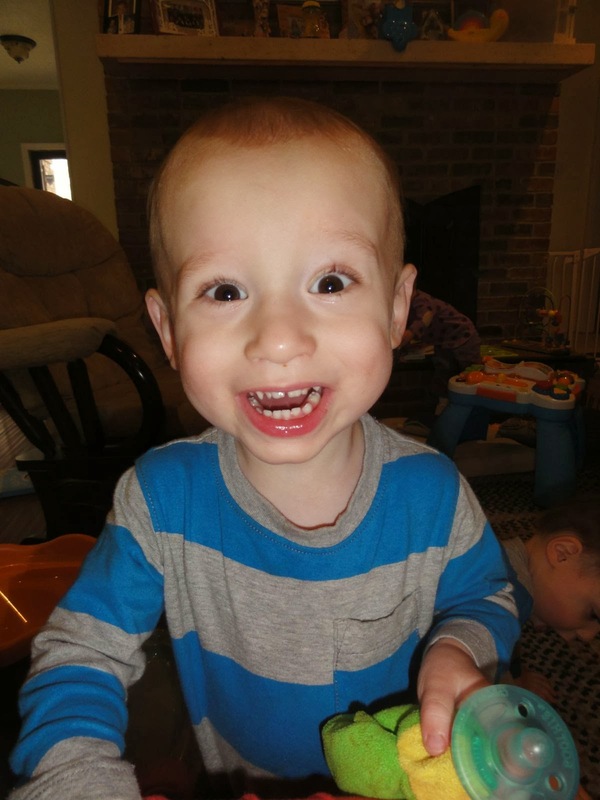 In other news, Seth has been doing amazingly well with walking, 4-5 steps at a time on his own, standing on his own (again; he had stopped doing it for a month or more), and getting up to a standing position without holding onto anything. His PT (physical therapist) wants to wait on the walker and foot brace because she thinks he's already getting so much better, plus she doesn't want him to become attached to a walker and feel like he needs it. Seth tried to use David as a walker again yesterday, but David bit him. Guess that free ride's over! Marcie and Gracie started saying "pretty" yesterday about Sarah's necklace. It sounds like of like "Pi-tee" with enough of a blurred "p" to kind of suggest the r sound. :) Gracie also said, "Hi, Daddy!" when Gavin came in last night. I didn't hear it, but he got her to do it again, except the second time she said, "Hi, Da-daddy!" It's snowing here today! Isaac's school closed early. It's always nice to have him around to entertain the babies. He gets them laughing SO hard! He's also a huge help to me in meeting their needs and running things around the house. It's good to have young legs and lots of energy and a helpful spirit, thank God! 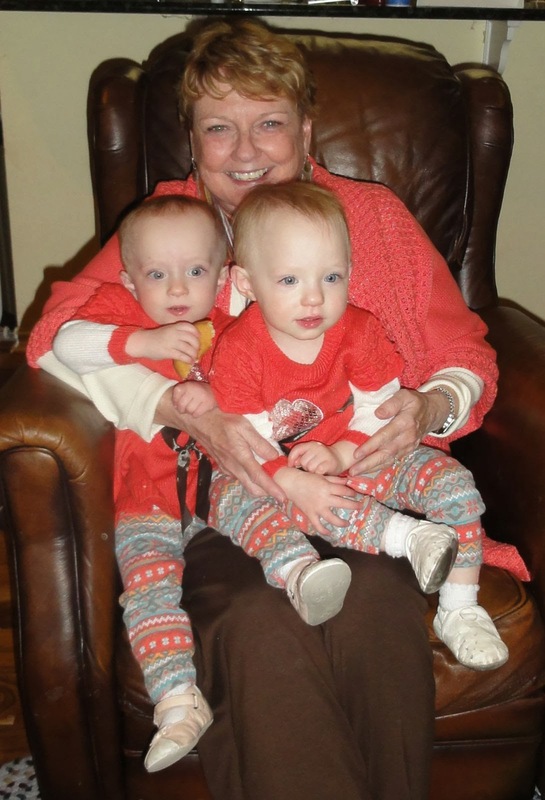 My beautiful mom with her beautiful granddaughters. The coordinating outfits happened by accident! Just some of the clothes I was sorting! David LOVES getting up on the table . . .
. . . especially if there's a computer. Thankfully it was password-protected, and he's gentle with the keys. Will and Gracie had to sit in the boxes, of course, after helping me unpack them a bit. This empty cabinet (NOT a fall and crush-risk, thankfully!) is a huge hit with the kids. David with Gracie and Will inside. Uh-oh, poor Grace. :( David persevered and won a spot inside. Marcie fell asleep on Grandpadad last night. David is walking by. 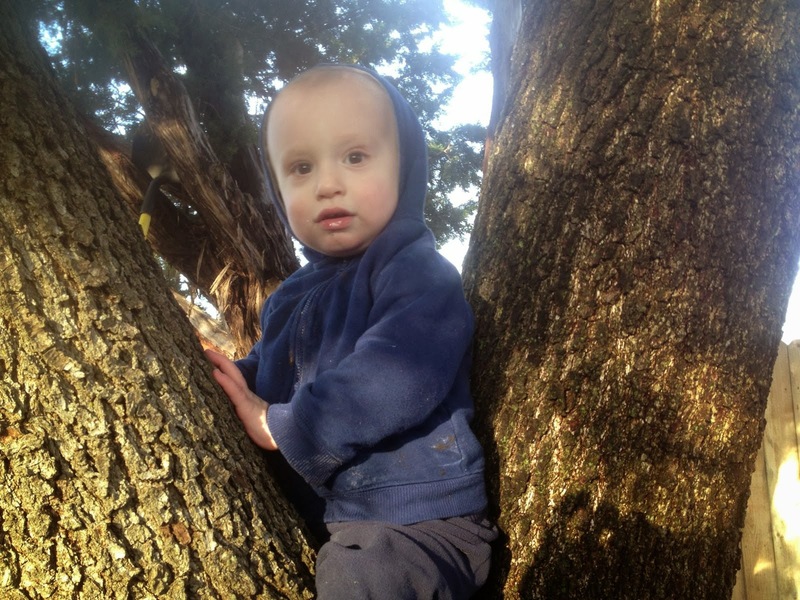 Apparently it's never too early to climb trees - or at least be put in one with Daddy standing right there! Little Ragamuffin Seth with a dirty nose and stretched-out shirt, looking adorable nonetheless! I wanted to mention in reply to those of you who have thanked me for keeping up with the blog, it would not be possible if it weren't for the lovely people who help care for our babies and do our house chores! So you really need to thank them. :) As I'm writing this Lynée is coping with a roomful of increasingly fussy, nap-ready toddlers, so I'd better run and help!